I know they say not to judge a book by its cover, but as soon as I saw the cover for Glass Girl, I knew I would love it! Glass Girl was the second book to be released in the indie line of Playlist fiction, and it’s really giving me hope for future Christian fiction. This book was so far removed from the peachiness that normally dogs Christian fiction. 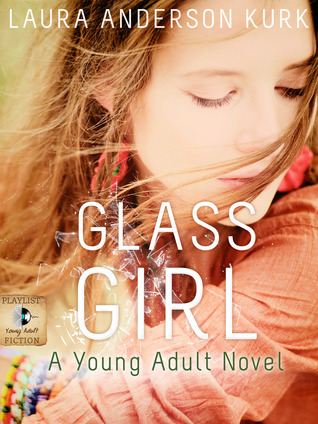 Glass Girl follows Meg, a shy caring girl. The book picks up not long after the tragic death of Wyatt, Meg’s charismatic older brother. Her family, trying to pick up the pieces of their shattered lives, decides to relocate to the other side of the country, from Philadelphia to a tiny town in the middle of ranch country in Wyoming. Meg begins to recover from the tragedy, starting at her new school with a clean slate. She meets Thanet, Tennyson, and the dashing young cow-boy Henry. None of them know of the heartbreak that haunts her and she starts to put her life back together. Unfortunately, the move does nothing to help her mother deal with her grief. Meg finds herself with a mother who is spiraling into a black hole of depression and grief. I found this book to be very well written. The author did a great job with the characters and the romance between the polite country cowboy, Henry, and withdrawn, city-girl, Meg couldn’t be cuter or more heart rending. I love the way Laura Kurk dealt with forgiveness on so many levels, looking at both forgiveness of self and people some might consider unforgivable. The way she handled grief was also amazing. The analogies she drew between Meg and glass were breath-taking! I loved the way Meg started out thinking she was a glass girl because she was easily shattered, and then learned that glass could actually be incredibly strong and hold up under immense pressure. I also really liked how sweet and just generally supportive Henry was. I loved that he wanted to show Meg her loved her the good, old-fashioned way! I’m so sick of boy+girl duo falling madly in love with each other in the first fifteen pages and having passionate make out sessions as soon as the opportunity presented itself. Trail rides and picnics and loaned jackets and walks to the front door are so much more romantic and refreshing in the current YA market. One thing I didn’t love was the Christian aspect of this book. I know that I hate peachiness, and I’ve very thankful that Christian fiction authors take such great care to avoid it. However, I wish this book had gone a little bit deeper at looking at how Meg had turned away from God after he allowed what he did to happen to her brother. And then, when she starts to heal, looking at her coming back to God with the loving leadership of Henry. I also didn’t quite understand why such a stellar Christian guy would be so seriously dating a girl who clearly didn’t believe the same things that he did. As a Christian teen, I didn’t quite see how someone like Henry would okay with dating someone as blatantly non-Christian as Meg. That being said, I loved Glass Girl, and would strongly recommend it to any high-school age girl or older. The sheer amount of touching moments, paired with sad beets and unmatched realness had tears running down my face on and off for the whole book. Sometimes I didn’t even know why I was crying, except that I just felt for and cared about the characters so much! I cannot wait for Perfect Glass, the next book in this series. I'm with you, Sarah, I loved this book. Henry is a wonderful example of what all girls deserve. Never settle for less than someone who is strong and true and caring and loves you for who you are. Sarah - this is a lovely review. Thank you so much for taking the time to really understand Meg's journey. I can't wait to put the sequel in your hands! It answers so many questions. :) Thanks for your sensitive nature and thoughtful grace!